Welcome to the first Splatterday Saturday, where we offer up an appetizing menu of pristine, immaculate gore from the 80s. 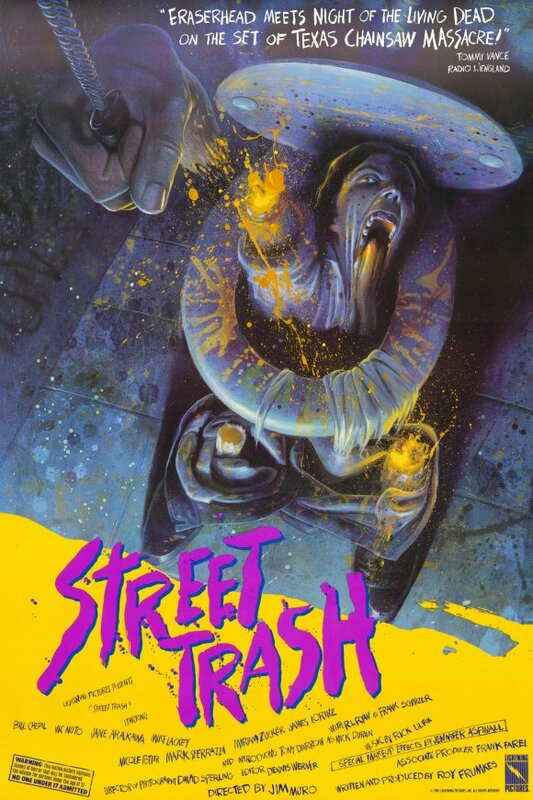 The first Splatterday will feature the awesome body melting 1987 film STREET TRASH! Leave it to the 80s to create a sub-genre called "body melting." Honestly, is any other decade really capable of producing such an outlandish thing? Regardless if you think so, Street Trash truly indulges itself in the art of body melting: bodies are melted in toilets, street corners and anywhere else you can think of. And, it's all done with purely gross creativity. With a title like "Street Trash," one can only assume a certain kind of atmosphere. Luckily, in this case, Street Trash brings exactly what you might expect. Indeed, the streets of New York have rarely (if ever) looked so trashy. This serves the film well, as the amalgamation of garbage-infused elements creates a tremendously trashy whole. Contextually, it captures a certain desolation of the era while simultaneously managing to maintain its comedic undertones. Perhaps the greatest success of "Street Trash" is its ability to discretely hide its commentary beneath its trashy exterior. While the film's absurdist portrayals of the homeless is entertaining and comical, it does allude to an interesting phenomenon. Namely, the tendency to perceive the homeless as other in an utterly repulsive way. The camera acts almost as a judgmental observer, constantly filtering reality through this absurdist lens. The result, of course, is an enormously exaggerated portrayal of the lives of the homeless dwellers of the streets of New York which seeks to demonstrate the extent to which we create boundaries between us and them.